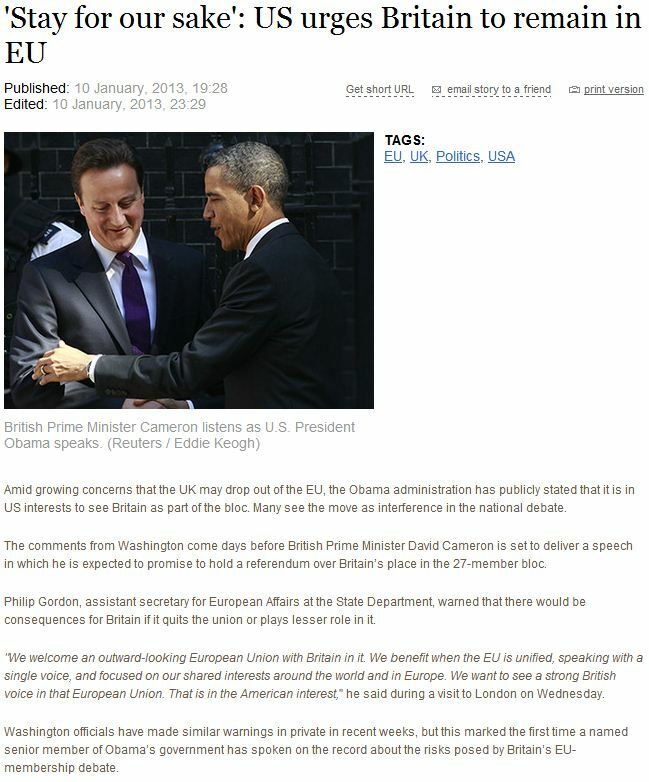 U.S. URGES U.K. TO STAY IN E.U…….. – The Tundra Tabloids……. U.S. URGES U.K. TO STAY IN E.U…….. Despite the undemocratic nature of the union of course. This type of thinking goes across the board in U.S. political circles. Those U.S. politicians who are ignorant of the statist guiding philosophy of the EU applaud it, because they only want one address in Europe to do business with. Call it political expediency. Those politicians who agree with it from a political perspective as well , I call Democrats and RINO Republicans. Previous Post Previous Post MARK LEVIN RIPS JOE ‘THE SHMO’ SCARBOROUGH FOR SLAMMING GOP……..
Next Post Next Post SYRIAN CHILDREN BRAINWASHING INTO THE ‘JIHAD IS COOL CLUB’……. The US has been the proponent of the European integration from the start i.e. since the end of the WWII. It is highly questionable for a State Department official to meddle with the internal affairs of a close ally like Britain. Of course Obama wants this because then he is sure Gr. Br. will also be economically destroyed like the rest of the European countries. How I hate socialists.